If you’re looking to make extra money this year, are a college student or simply have extensive knowledge in a particular subject, tutoring could be a good fit. Online tutoring allows both students and tutors to set up times that work in their busy lives. This makes online tutoring a very flexible and in-demand job. This job also pays well for a work from home job with hourly rates ranging from $9-$23 per hour for new tutors! 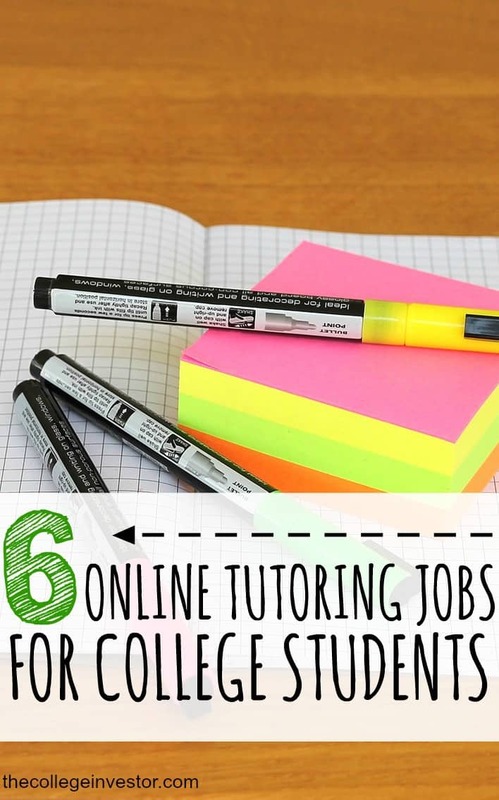 If you think tutoring could be the perfect side hustle for you here are 6 legit online tutoring jobs for college students. Tutor.com has been around since 1998 and is one of the most popular sites for high quality tutoring. This site claims to only hire “the best of the best.” They look for college students, teachers, professors and industry experts to tutor in one of the many subjects that they cover. Tutor.com offers services to K-12 students, college students and adult learners. To become a tutor for Tutor.com you’ll need to complete an application found here and pass an exam in the subject area of you want to tutor in. Pay: You’ll be paid a set hourly rate depending on the subject you’re teaching. It appears that tutors can earn $9-$16 per hour but $9/hour is the starting rate for new tutors. Chegg.com has been around since 2003 and connects students needing help with online tutors. Chegg.com is aimed to primarily tutor middle school, high school, college students and professionals. With Chegg you can log in whenever it’s convenient for you. Chegg will then match you up with students. If you’re rated highly then more opportunities will be presented to you. You can create an online tutoring account with Chegg.com here. Pay: All tutors are paid $20 per hour for the time spent in a lesson and the time spent writing a student’s lesson explanation. Payments are made every Thursday via PayPal. StudyRoom is a bit different than the first two opportunities as this one allows students to help other students from their college or university. With StudyRoom students who need help can ask specific questions or request one-on-one tutoring for a specific class or topic. If that class or topic pertains to you as a tutor StudyRoom will send you a notification and you can choose whether or not you want to take that job. You can apply to be a StudyRoom tutor here. Pay: According to their website tutors can earn up to $20 per hour. StudentTutor offers SAT prep, ACT prep and tutoring both online and in their five locations across the U.S. This site caters to 6-12th grade students needing help in math, science, English and more. StudentTutor hires college students with at least a 3.0 grade point average or better. There are also other requirements like having strong math skills, passing a background check, and having prior experience tutoring 6-12th grade. SAT tutors must have a score of 700+ per section and ACT tutors a 30+ per section. You can check out the other requirements and apply to be a tutor here. Pay: The pay for Student-Tutor.com is $16 per hour for online academic tutoring and $23 per hour for online ACT/SAT prep. StudyPool is a newer platform that allows tutors to bid on questions submitted by students. Here’s how it works: when a student has a question they submit to the StudyPool website. Tutors can then bid on the question with a price and a delivery date. If the student chooses your bid they go ahead and pay StudyPool and then you have to deliver on your end of the bargain. Once your session with the student has ended and the student is satisfied StudyPool releases payment to you. You can create an account with StudyPool here. Pay: When you want to withdraw your money StudyPool will pay you via check (if you live in the U.S.) or through PayPal, within three business days. StudyPool takes a 20-30% commission of what you earn so your hourly rate depends upon the questions you’re answering and bids that are being accepted. You can read our full review of StudySoup here or sign up with them here. Pay: The pay for StudySoup varies. Elite note takers can earn up to $1,200 per month. Earnings are paid throughout the semester via PayPal or direct deposit. 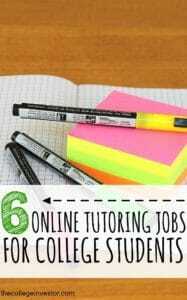 Online tutoring jobs are a great fit for college students as they allow flexibility and very competitive pay. If you have the time you can also become a tutor for multiple sites increasing your earning opportunities. It’s important to recognize though that when you take one of these online tutoring jobs you’re being hired as an independent contractor and not an employee. This means you’re responsible for paying your own taxes and should plan accordingly. I used Chegg all the time in college as a study tool. They’re great about hiring tutors and the more you help others, the more tutoring jobs (and money) you get! Highly recommend – great list.